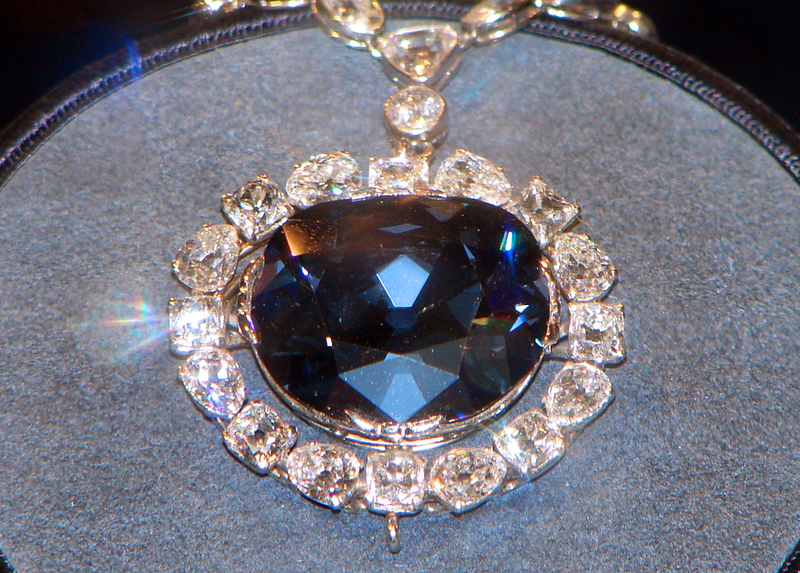 Though claims of its infamous curse are fictitious, the Hope Diamond nonetheless has a history filled with intrigue and mystery. The original article I wrote can be found here. Glinting brilliantly from within its setting of 16 white diamonds, the fabulous 45.52-carat blue gem (which fluoresces red under ultraviolet light) known today as the Hope Diamond draws millions of curious visitors to the National Museum of Natural History at the Smithsonian Institution. It is likely that many of the visitors flocking around its bulletproof glass case have heard tales of the misfortune that befell anyone who owned the supposedly cursed stone. These stories are largely exaggerated, but the history of the Hope Diamond is still a fascinating journey through revolution, crime, and the tangled fates of kings and tycoons. The first definitive record of the stone that would become the Hope Diamond occurs in 1669, when French merchant Jean-Baptiste Tavernier sold it, along with about 1,000 other diamonds, to King Louis XIV. Tavernier never specified where he obtained the gem, which then measured a whopping 115 carats, but over the years a legend arose that he stole it from the eye of a statue of the Hindu goddess Sita. While this is almost surely false, current scholarship estimates the diamond was probably found in the Kollur mine in India, and was obtained by Tavernier between 1640 and 1667. For many years thereafter, the famous blue gem would reside in the exalted pantheon of the French crown jewels, and it became known colloquially as the French Blue. Louis XIV had the stone set in gold and wore it on a ribbon for ceremonial occasions, while his successor, Louis XV, set the Blue in a jewelled pendant in 1749, in a design commemorating the Order of the Golden Fleece. There the gem remained until 1792. At the cusp of the French Revolution, the Royal Storehouse was robbed by an ever-expanding gang of thieves. Nearly all of the French crown jewels disappeared, including the French Blue, which didn’t turn up again until 1812, incidentally right after the 20-year statute of limitations on the theft had run out. London diamond merchant Daniel Eliason was now the lucky owner of the gem, perhaps obtained after a brief stint in the possession of British monarch George IV. Presumably, Henry Philip Hope bought the stone from Eliason sometime before 1839. At this point the gem had been cut down to nearly its present size, and placed in a medallion often worn on a necklace by Hope’s sister-in-law Louisa Beresford. The gem passed down the Hope family line, making brief appearances at exhibitions in London (in 1851) and Paris (in 1855). Lord Henry Francis Hope Pelham-Clinton Hope received the diamond as part of his legacy in 1887; his American wife, May Yohe, later wrote and starred in a serial where she exaggerated upon stories of the blue gem’s supposed curse, all of which were completely spurious. After Lord Francis divorced May Yohe in 1902, he sold the Hope to a London merchant for £29,000, who then sold it to a New York dealer. It made a brief detour to Turkey as part of the collection of Sultan Abdul Hamid, then traveled back to Paris where it ended up in the possession of Pierre Cartier. The famous diamond merchant sold it to American socialite Evalyn Walsh McLean in 1910, after placing it in a more modern setting. McLean wore it often, and left it to her grandchildren when she died in 1947, though the stone was sold to settle debts two years later. The next owner, Harry Winston, after taking the gem on tours of the U.S. and showing it at charity balls along with other famous gemstones, donated it to the Smithsonian in 1958, sending it through the regular mail in a brown paper bag. The gem has been on display there ever since, other than when it was briefly loaned to other museums, and today it can be seen in all its glory in its own rotating glass case, the lighting of which was specifically engineered to show the diamond’s blue brilliance to best effect. Fowler, Marian (2002). Hope: Adventures of a Diamond. Diane Pub Co. ISBN 0756767040.